I have a feeling your in-laws cared more about the face rather than your and your’s wife wish. 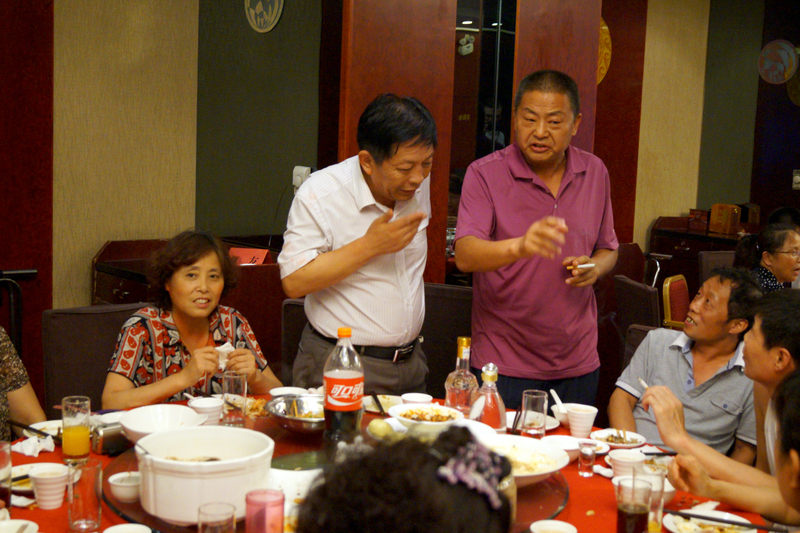 My husband’s father first wanted to make a banquet for everyone in the factory (! ), ‘luckily’ one of our 15 guest were boss’ son, other high person and father’s driver, haha. I like the custom of having multiple weddings. I wish my relatives living in different parts of the world would do that; would make it easier to organize which wedding to go to. Crazy to not know 80% of the guests but that’s how it goes. Is that common at a big 喜酒? Seems like it was a successful dinner though ! 🙂 but I have to admit, reading this is making me nervous about my wedding haha. My father-in-law has already told all he’s coworkers and he’s boss in Beijing that they have to come to our wedding , but Chenchen and I haven’t planned anything yet, like when and where we will marry. But seems like my father-in-law got it all planned.. Haha. My husband and I had three as well. I don’t want to give too much away (I am in the middle of writing several blog posts about weddings) but our Canadian wedding was a blast – a day of celebrating with our family and friends. I knew everyone and my husband had met at least 80 of our 100 guests during previous trips. And every year on our anniversary, people still take the time to share their fond memories of our wedding on facebook! My husband and I had two weddings, one western style one in the city and one Tibetan style one in the village. The western style one had the traditional elements, cutting the cake, dancing the night away etc. The village one was a picnic on a hill, which isn’t very traditional (the bride is traditionally suppose to be tucked away in another room being consoled by female relatives…) but was much more preferable! It’s hard to believe that one would not know so many guests at their own wedding. But then, in China the wedding is more about the parents than the bride and groom right? At least it was an interesting experience! Sounds like you had an easy wedding reception dinner. That is terrible to hear that some guests helped themselves to some bottles like they were part of the non-existent goody-bags at the reception. I hope most of the guests had the decency to bring a gift, or more popularly fat red packet. In Malaysia, my family tends to give $200-300 (Malaysian dollars) worth of cash in the lucky packet. 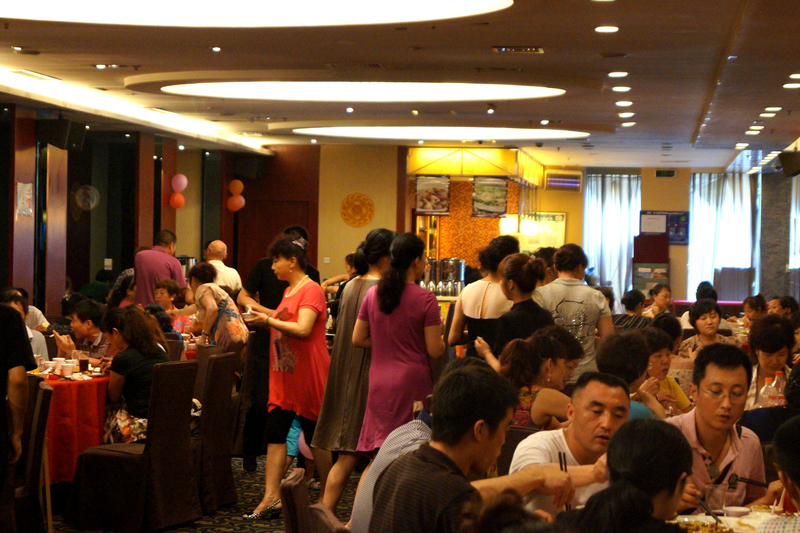 I have been to several weddings in China and I have to say I don’t like them, it’s just about eating and drinking and more drinking. Finish the meal and go home quickly. They’re too short. I’m not a big fan of Spanish weddings either because they are too long. More than an hour in the church, then another hour outside waiting for the couple to sign all the papers and get out, then going to the restaurant where the meal is going to take hours, then dancing to awful songs. The best weddings I’ve been were in the Philippines, the couples always organize games for the guests and it is a lot of fun. I will consider having a Filipino style wedding if I get married haha. My eldest daughter celebrated her wedding last year. They had three celebrations, first was a registration with a marriage celebrant held in a nice outdoor garden here locally followed by just a table of guests (their friends, me and her sister). Then a year later, they had two other celebration dinners this time bigger ones and the one in China was hosted and organized by her in-laws and was very similar to yours. 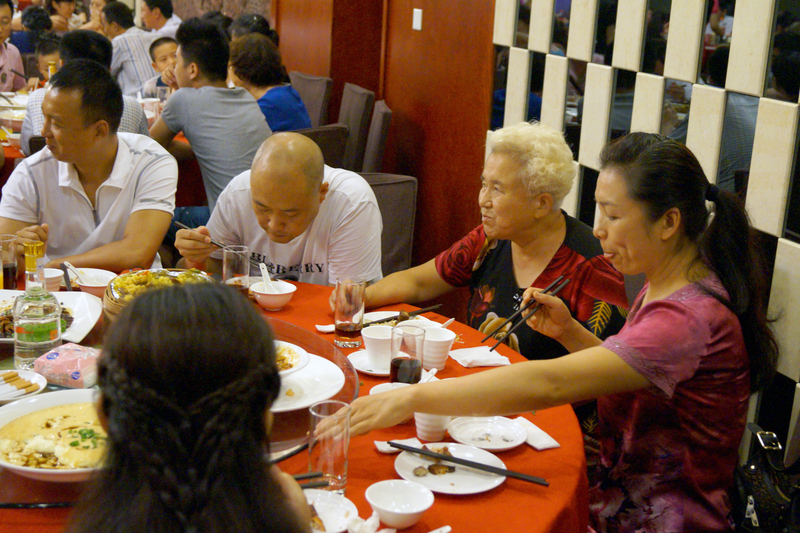 As a parent, we went too and my family was treated to different restaurants every night each hosted by an uncle or an aunt the next day and another uncle or aunt. To most Asians, celebration calls for food, drinks and merry making but I share the same opinion as Marta (above comment), Chinese dinner are so short, they just eat and drink and go home. In Malaysia, Singapore and New Zealand, we eat, drink and we mingle and talk. Did you try their famous MouTai Liquor? Yum Seng ! Sadly as all pictures were taken either by me or by elderly women with their mobile phones, there are none of us. Anyways, at that ceremony my wife had just a “normal” dress and I had also just some black jeans and a nicer shirt on. It was pretty informal occasion. Oh my god! I am already fed up with those large scale of wedding/ birthday/ engagement parties, I really didn’t see any meangingful substance apart from show-off, business and fake smiles. I am sorry to say, those parties just make me too sad. It is hard to believe it still happens on young couples in China, and only few of them say NO to their parents. As a Chinese, I do think kids in China ough to revolt against thir opressive parents. Neither me or my wife liked this Chinese celebration too much. It was stressfull, people visited basically for free food and drinks and to get a glimpse at the foreigner. I experienced too much of this kind of facade smilies/ being friendly in China. Sure I havent met all the people their yet, just a small chunk, but they pretty much behaved similar with a few nice execptions. You mean your wife didn’t want to do zuo yuezi? Wow! That’s revolutionary in my book. Between both of my sisters in law, I’ve got 5 nephews. 3 born since I’ve known my husband. They sat yuo yuezi every single time. My MIL even said to my husband, who in turn translated and told me, “You don’t have to worry about special food during zuo yuezi, Ashley, I’ll cook for you and take care of you.” Nice of her to offer, except I have no intention of doing that. I also don’t have a baby yet, I’ll admit it really irks me that they talk about that stuff to you like it’s a given. I mean, I’ll do it when I’m ready and I’m not going to do it just to give you a grandchild, that baby is going to be mine. Sorry to sound so harsh, she’s actually a very well-intentioned lady who does not really oppress or impose on us in any way (by ‘us’ I mean my husband and I). It’s just that they’re not used to boundaries in Chinese culture, boundaries are a big thing in America, though. It’s not okay to cross my boundaries n Taiwan, in America, anywhere! Although I do cut my in-laws some slack since I know they’re oriented differently. But I fear if at some point they do overstep too far, I may have to put my foot down in a major way. Which parts are harmful? I know a lot of it seems agonizing, boring and uncomfortable, but I really don’t know that much. For example the no washing rule. This is especially bad when you breastfeed the child and all kind of bad stuff from the body basically rubs on the child which in turn can cause infections. I’m in the US now and have been here since July (spending time on both east and west coasts, presently Pacific NW, which I think you already know since you’ve been reading my entries 🙂 ). Thus my mind has kind of moved out of the Chinese realm as I’ve been strictly dealing with life in an American-style way for a while- I’ll be heading back home in early December. Anyway, yeah ‘no washing’ is not safe. I have discussed this with numerous students, friends, colleagues and associates. Across the board Taiwanese tend to think refraining from showering should be at least followed to a degree, ie ‘less showering than normal,’ though not necessarily stopped altogether. For me, I’m totally right there with you regarding the obvious risks mother and baby would be subjecting themselves to. It’s much more than ‘culture’ as so many Chinese claim, it’s a difference between healthy and unhealthy. What they think is so necessary for health is actually quite the opposite and the traditions are so strong that talking them out of it is pretty much impossible. The idea is that after birth a woman is ‘weak,’ thus she should refrain from physical exertion (zuo yuezi prescribes spending as much time as possible in bed, actually) not showering seems like the worst possible idea. I mean, if they believe her immune system is compromised, staying clean should be a priority. As I don’t believe women are as weak as the Chinese traditionally believe after birth, this tradition and these beliefs sometimes make me want to tear my hair out. But I suppose that’s all part and parcel of living abroad and partaking in a cross-cultural marriage. Luckily my husband has told me time and again that he would never force me to do anything against my will (insofar as participating in traditional behaviors like zuo yuezi) but he certainly thinks that such things are beneficial. He has told me before that I should consider having some sesame oil chicken soup after giving birth because it would “restore my strength.” I am a pescaterian, I only started eating seafood 5 years ago and I have not eaten meat since I was 17! Therefore I think that if and when the time comes for me to have a child, I’ll come back here to give birth in a western hospital. After all, I’m terrified of childbirth and communication with my doctors in English is going to be extremely important to me. My MIL made a lot of special dishes for my eldest sister in law after she came back from her zuo yuezi in a ‘baby hotel.’ They were full of peanuts and ground meat and oil. They would sit in the fridge and congeal into gelatinous chunks- totally unappealing! Yet such soups are alleged, as you mentioned to increase milk production for the new mother. Drinking water makes much more sense. As a person who enjoys pushing myself athletically I think I would lose my mind if I were to be forced to remain in bed and I didn’t feel like it. I have heard of female runners who ran right before or right after giving birth, as extreme as that sounds, it just goes to show what the body is capable of. If you believe something strongly enough, I guess you can ‘make it true’ and that’s how this whole zuo yuezi business resonates with me. It’s just a set of ideas that is reinforced everywhere a person turns within the Chinese context so it’s become unanimously accepted and enforced as a result. I’m sure we have things in our own cultures which we’re not aware of and that we also just accept because they’re so ingrained in our acculturation. It is very interesting why in traditional Chinese believe they have the idea that a women is so weak after giving birth or even weeks afterwards. For example when my mother gave birth to me they started for her some basic muscle training right away next day at the hospital, in order to strenghten her again! My wife went totally against zuo yuezi and this brought a lot of bad mood and fear from her Chinese family. However this changed after they realized that my wife and the baby were absolutely fine or even doing better than other pregant women. For my wife (and me) the Chinese believe is just too outdated. It is, except of few food things, not backed up by modern science at all, and this resulted that my wife prefered the more modern Finnish way of handling everything. 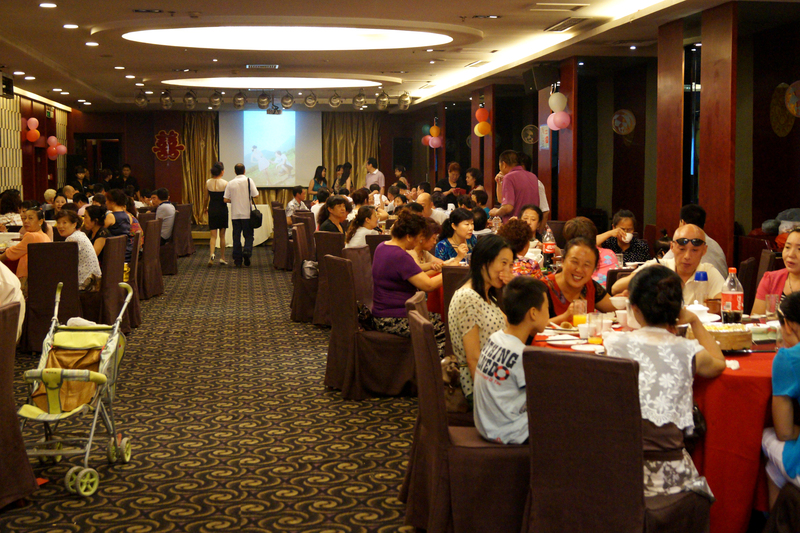 I heard also about these baby hotels in Mainland China and I must say that they must be a huge business opportunity. I mean there are people actually paying money to get unhealthy! As my wife is not a real sporty type she didnt start with any sport till months after giving birth but she started to take walks outside just after one week (we had around -14 degrees celsius during that time). Hey no problem. Perhaps I should check my own spam section to see if comments are just sitting there. Something I never considered to do before. Yeah, I feel pretty uncomfortable with the ideas of women as weak, especially within a culture that (and I’m quoting my husband’s Aunt who is herself Taiwanese but has lived in America for 40 years) “always emphasizes boys.” It just seems like another way to (and perhaps I’m being paranoid) try and passify women and let the men feel more manly and run everything. I guess it’s not so bad as some Middle Eastern countries or even African countries (where women are sent to isolating mentrual huts during their period as they are thought to be surrounded by evil spirits during that time of the month). But Taiwan and China for that matter, are progressing at a rapid rate in every way except superstitious behaviors. I think it’s really holding them back. European and Western people (like us) are never going to buy into these kinds of ideas. As you said, they aren’t backed by modern science. Not to mention all of the examples of women and babies who turned out just fine without zuo yuezi. I’d never even heard of it myself until 2010 and my first reaction was that it sounded nuts. I’m a little bit more respectful of the tradition now (when it’s not practiced in an extreme way), but still wouldn’t want to be forced into it. Like your wife, I’m sure I will deal with plenty of tsk-tsk-ing and be frowned upon should I opt out. But I wil just need my husband to be supportive. Nobody I’ve ever known personally in the US has done zuo yuezi and none of them ever had any complications (as far as I know). In fact, my own parents moved across the country when I was only two weeks old, which means I was on an airplane for 5 hours. Such a thing is unheard of in Taiwan. Your former swimmer friend sounds really rugged getting back into running in the cold weather so quick after having her baby. I want to be like that! Hopefully I’ll be able to do it 🙂 It never gets that cold in Taiwan, though. When my wife’s nephews had their “ceremony” it was this big lavish affair which was paid for out of all the cash gifts in the red envelopes. My wife gave them something like 2000 RMB, but I know others gave a lot more. The thing That really got to mw was after the party was paid for, the extra didn’t go to the bride and groom, the parents split it between them to pay for all their time and effort in planning the huge event. I handled it pretty well as i had only a few drinks. We had also the tour from table to table but at most of them I only had to drink some soft drinks. Good of you to have the danger zone staked out beforehand. That way you could be prepared. There are a number of tricks you can pull to make it appear that you are actually drinking more than you are. But I guess you weren’t mixing whisky with green tea (which is what one of my TW business English students said they usually do in social situations in China). I’ve never heard of 白酒 in Taiwan, but I imagine it must be similar to Kaoliang which is a strong liquor made of sorghum that is Taiwan’s favorite after whisky (which they don’t mix with green tea). As a girl, I even get pressured to gan-bei in many situations, but I can usually get away with demurely brushing them off and they won’t continue to bug me. But they’re really aggressive with the guys. It’s impossible to keep up with old uncles like that because their livers are definitely pickles and nothing can phase them. Good on you for handling it pretty well. I know also some uncles and they would drink me under the table in an instant. When we are out eating they drink so terribly much booze and beer and still behave normal!